Not all sea creatures are fish. Whales are not fish, and abalone is not a fish. Biologically, abalone is closely related to the snail, belonging to that family of creatures the creep around on one foot. Not only is abalone meat delicious, but its shell is also gorgeous (unlike the snail) and makes a naturally impressive serving dish. The pearly inside reflecting light and color has a unique charm, and this Mother of Pearl is often used to make buttons or inlaid furniture. Abalone pearls, popular in Australia and New Zealand, are a little different to traditional pearls in that they are not so round, and the surface is more glossy and beautiful. When creating abalone dishes the shell is almost as important as the abalone flesh, making for sophisticated presentation, like the icing on the cake. 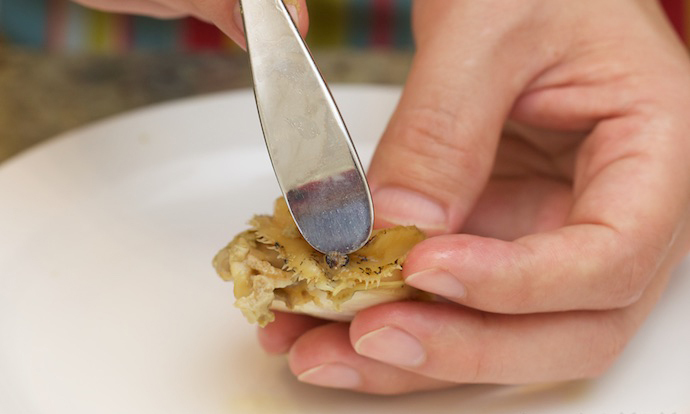 Today I will show you how to make sliced abalone served in its shell. 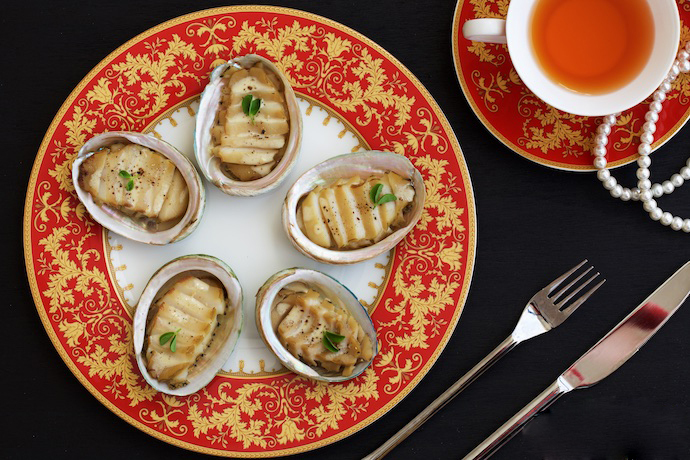 After cooking, the abalone is cut into thin slices and put back in the shell and served with a sublime sauce, creating a visual and taste sensation. It makes a fantastic appetizer or entrée. 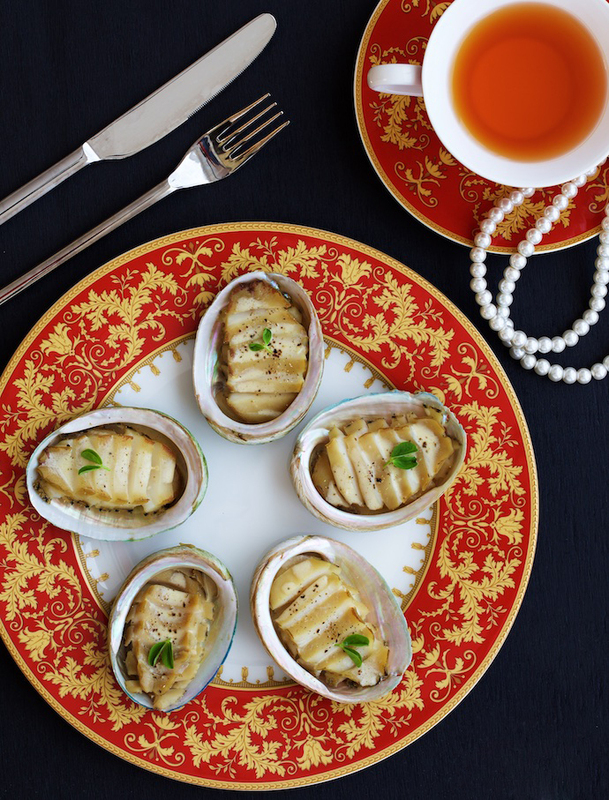 Abalone is not served with traditional Western ingredients, but some Western culinary techniques can still be used to cook it, giving an unexpected effect. 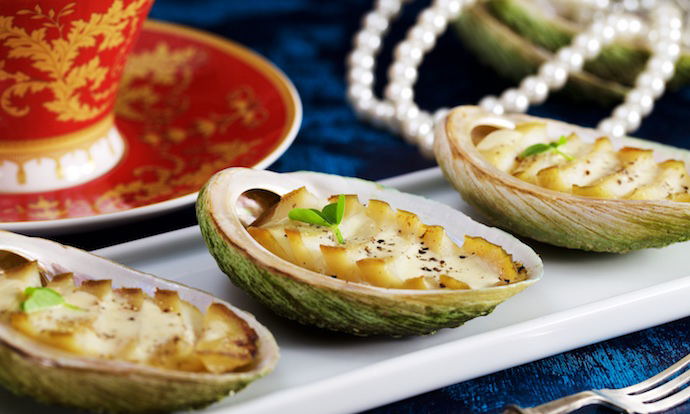 For example, traditional Chinese food practices usually discard the abalone’s intestinal organs, only eating the muscle. 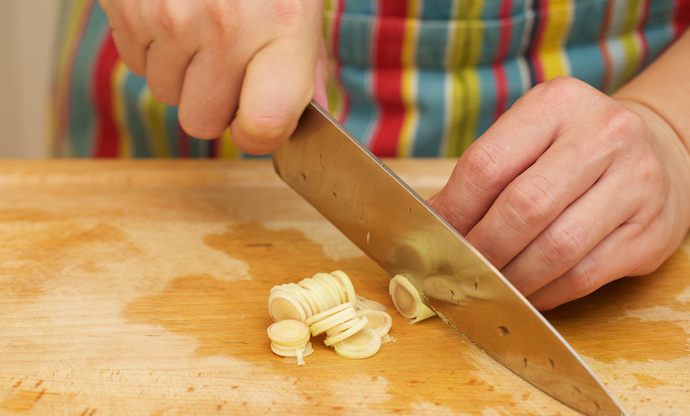 However, Western cooking practice often uses the organs to make a fuller flavored sauce. 8 abalone, each weighing about 80 grams. 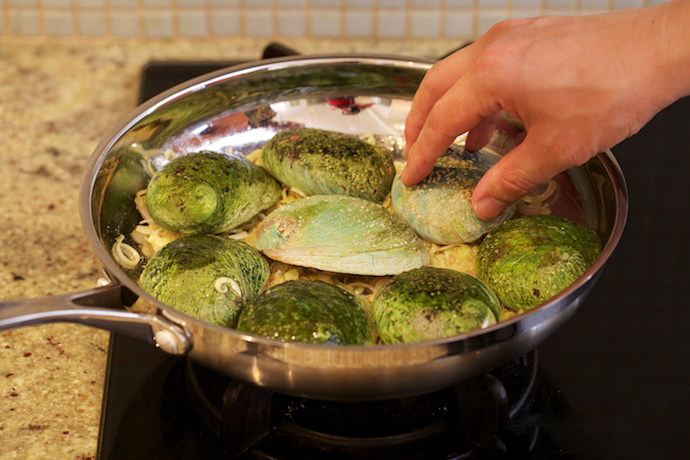 The abalone can be fresh or frozen. If it is frozen thaw it in the refrigerator, never use a microwave oven or soak in water soak. 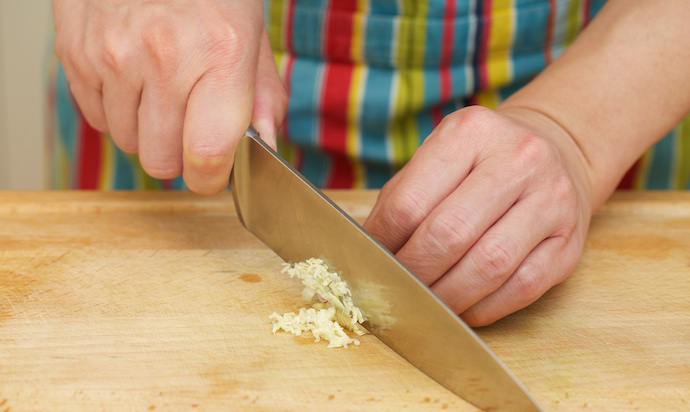 Using a large knife, finely chop the garlic. 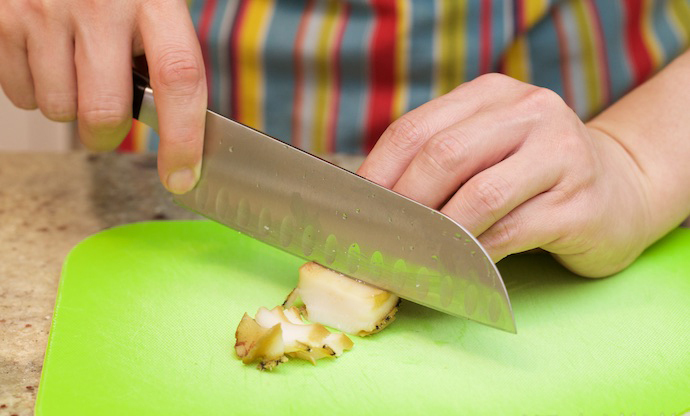 Slice the ginger into fine strips. 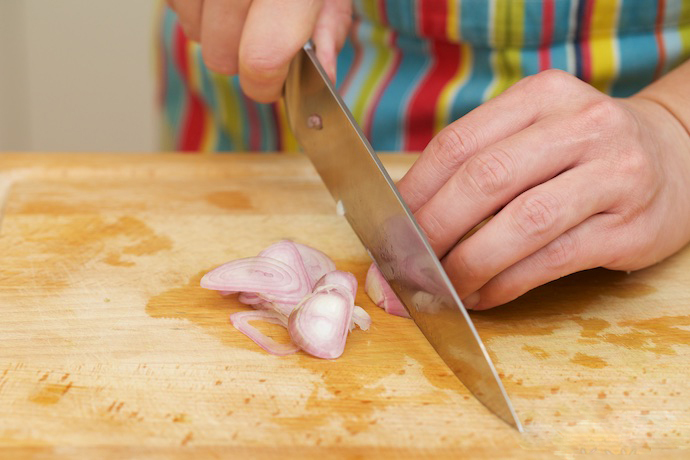 Slice the red onion as finely as you can. 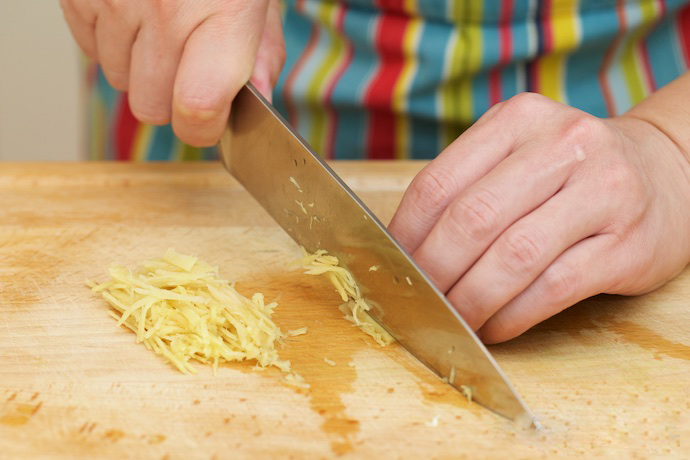 And finally, slice the piece of lemongrass thinly. 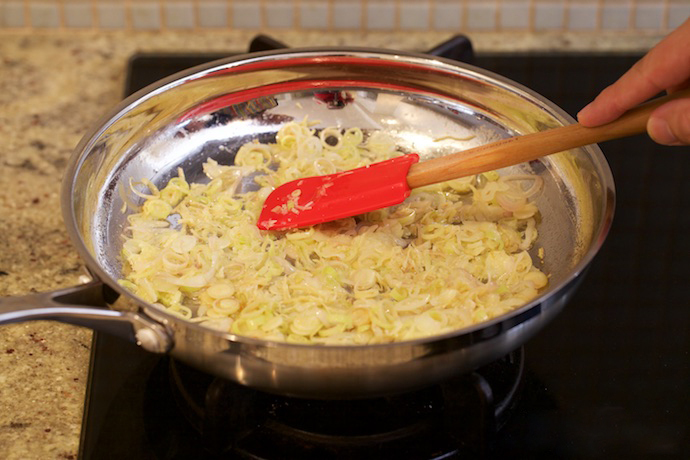 Take a heavy based pan, with a diameter of more than 26 cm, and preheat for 30 seconds. Add the olive oil and butter. 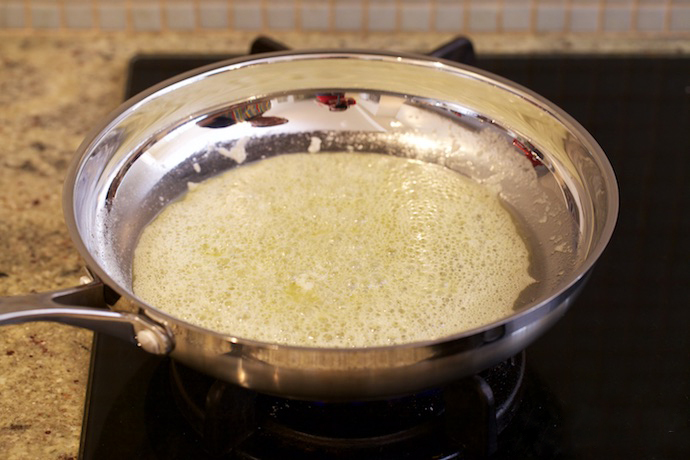 As the butter melts the water begins to evaporate, and the butter begins to bubble. When the bubbles subside, add the garlic, ginger, red onion, and lemongrass, and stir fry for two minutes. Cook the spices only until they have softened, but not browned, and exude their delicious fragrance. Spread them out evenly over the bottom of the pan. Place the abalone, shell side up, on the bottom of the pan. 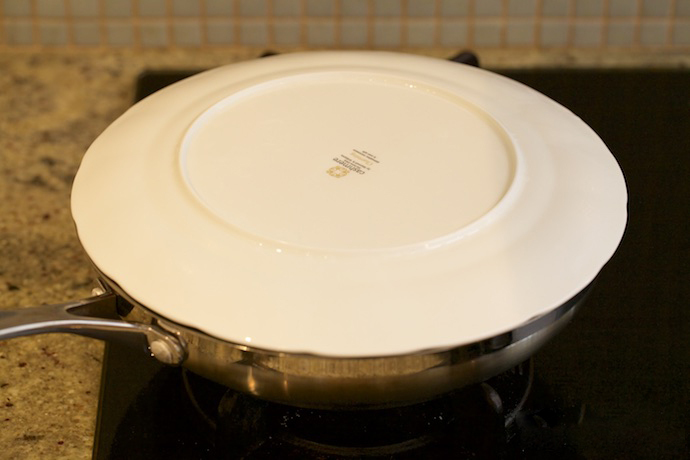 Put the lid on the pan (if there is no lid, use a dinner plate). Heat on medium for 20 minutes. During the heating process the abalone will precipitate some liquid as it is half-fried and semi-steamed, so you don’t have to worry about it coming out dry. We will use this liquid to make the sauce to drizzle over the abalone. 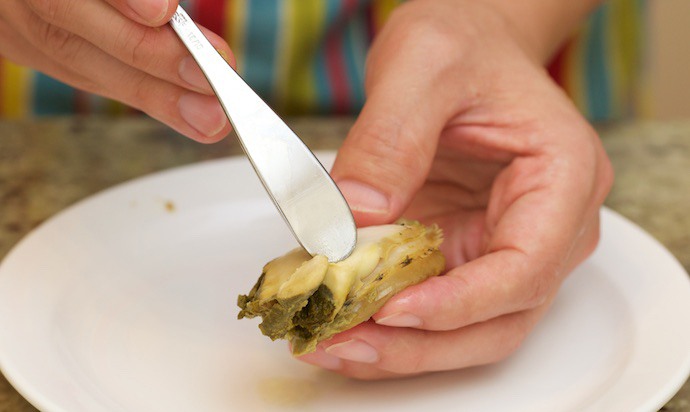 After steaming, take the abalone out of the pan with tongs and using a large stainless–steel spoon, remove the abalone meat from the shell, making sure it stays in one piece. The abalone’s internal organs are the reverse of most other animals and are not symmetrical, but appear on the outside like scallops. The abalone’s mouth is located at the end of the muscle, with a small opening that you will easily find. Tear the mouth part and the abdomen off the main muscle. You will have a digestive gland (beige area as shown in the picture) on the intestinal organ. 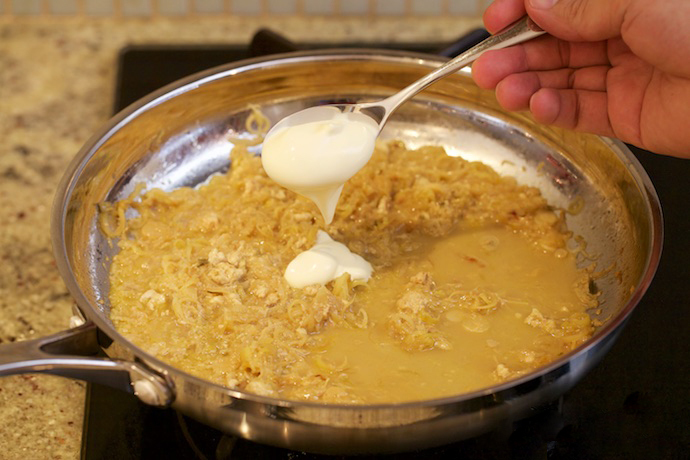 Keep the digestive gland for the sauce and throw out the rest of the intestinal organ. Add the abalone digestive organs and crush them into the sauce, then add the dry white wine, and heat until the liquid reduces by half. 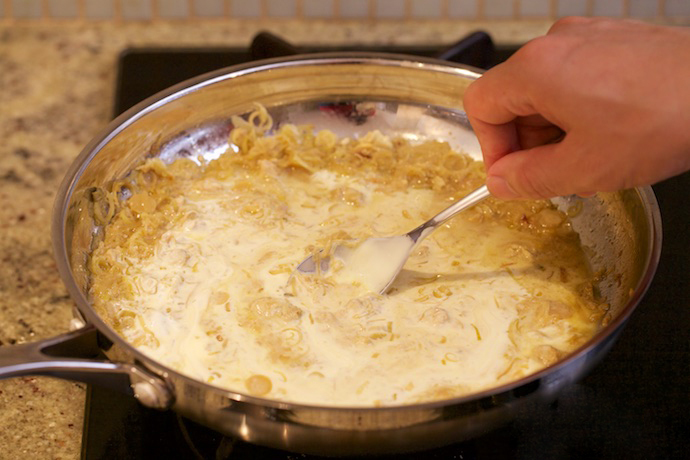 Turn off the stove and add the cream. 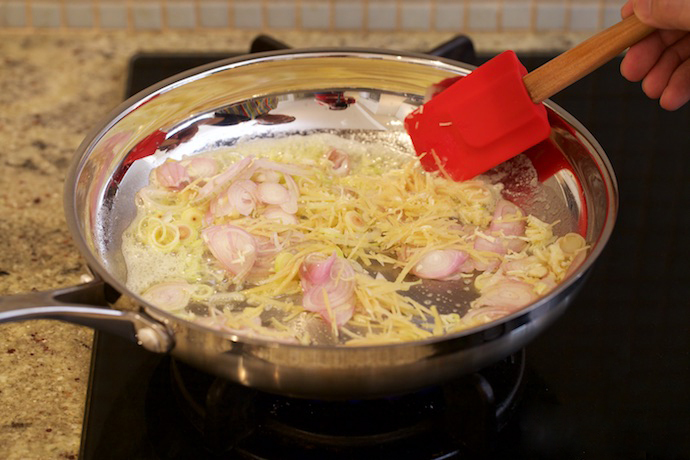 Stir through evenly to make an exceptionally delicious sauce! But we’re not finished yet. 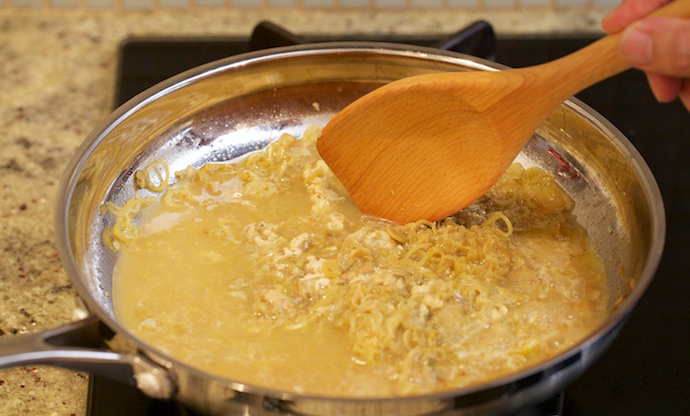 There are too many solid ingredients in the sauce, so it will need to be strained before you use it. 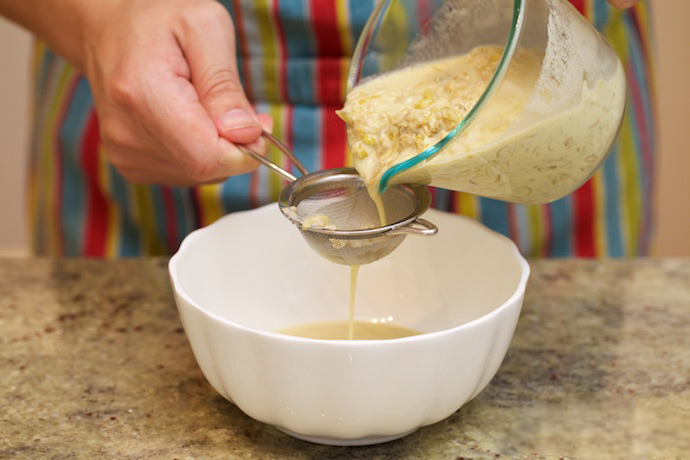 Pour the sauce through a fine sieve and filter out all the solid ingredients. 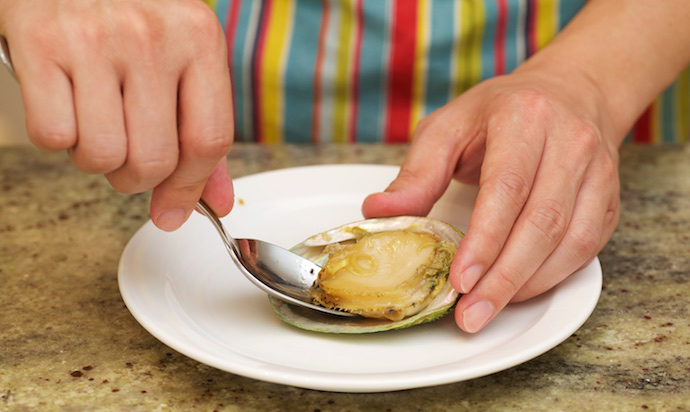 Slice the abalone meat into thin slices, and put them back into the shells, arranging them in their original shape. 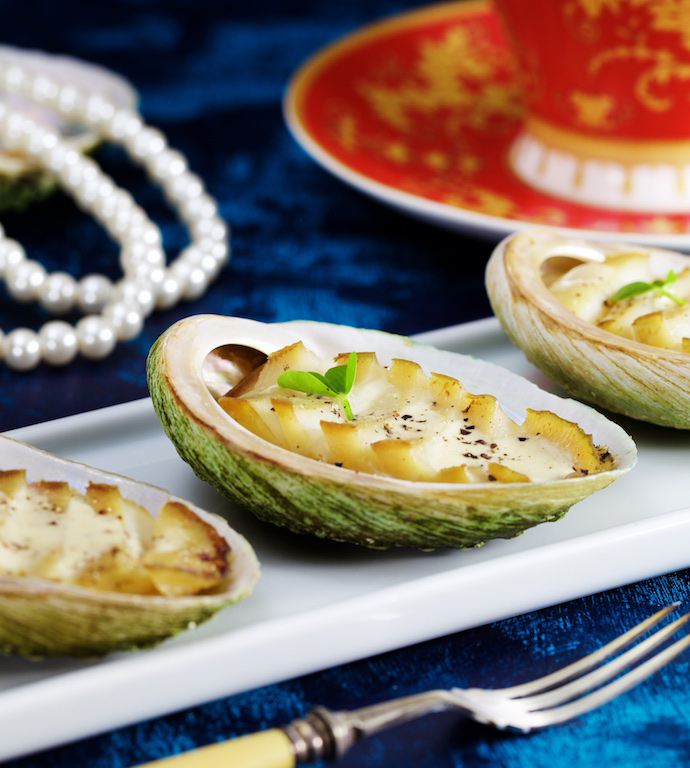 Drizzle a little of the fragrant creamy sauce down the center of each abalone, sprinkle with ground black pepper, and garnish with pea leaves. Slicing the abalone means you get more surface area and better coverage with the sauce, which all means it’s gonna taste better! 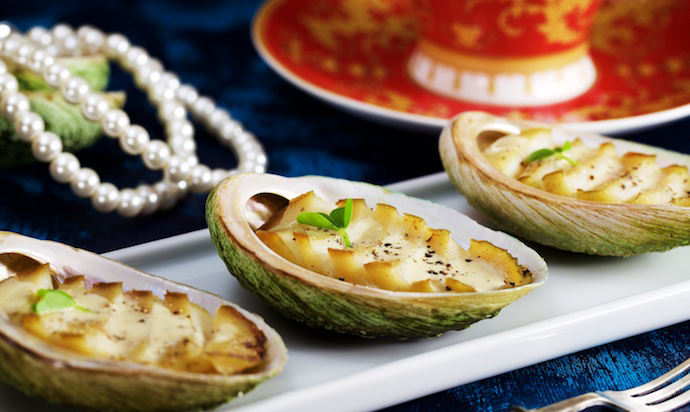 Tasty sliced abalone in a pearly shell is a dish fit for a king; serve up to your right royal guests!